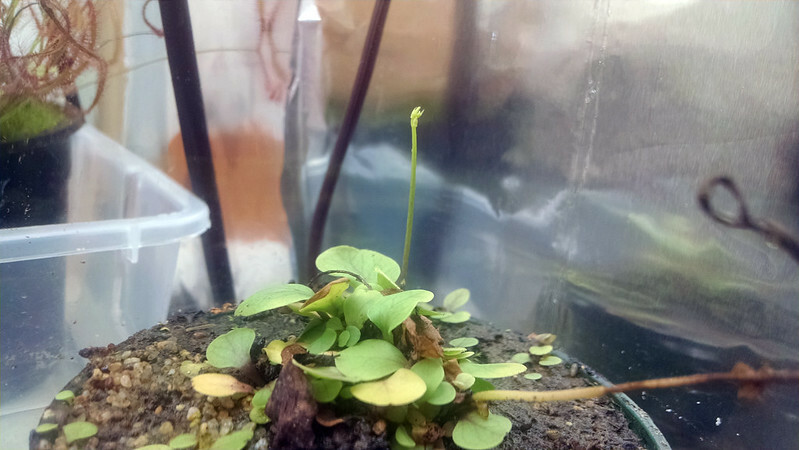 Flower stalk on Utricularia calcyfida |Sundews Etc. I've got some action over in my Utricularia calycifida pot. U. calycifida is in section Foliosa. They have bigger "leaves". I like the little mound. I really like this plant. It's been growing pretty solidly and spreading in the pot. Now it looks like I'm going to get a flower stalk! 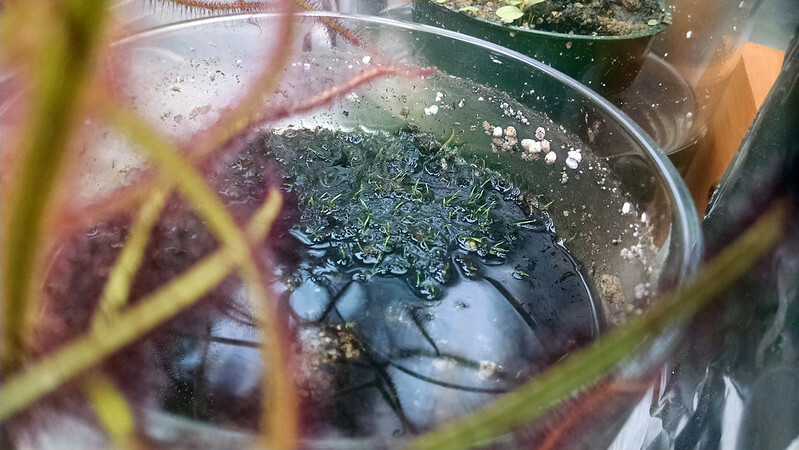 I've been reading a bit about foliar fertilizing on Utricularia lately, and think maybe I should give it a shot. I feed my Drosera at least once a month, but my Utrics don't get any love. Maybe there would be even more blooming and spreading then. 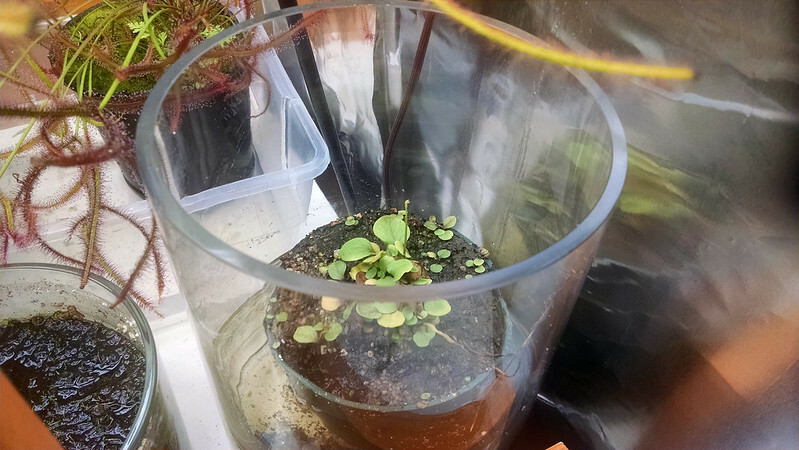 Things are a little funny over in the Utricularia livida pot. Getting a little messy over here. First of all there are those weird leaves that some people have suggested might be Utricularia tricolor. Secondly, the peat is all pushed up and furrowed. I don't really know why. Maybe I have earthworms in here? I don't know where they would have come from. The plants look pretty healthy anyway. 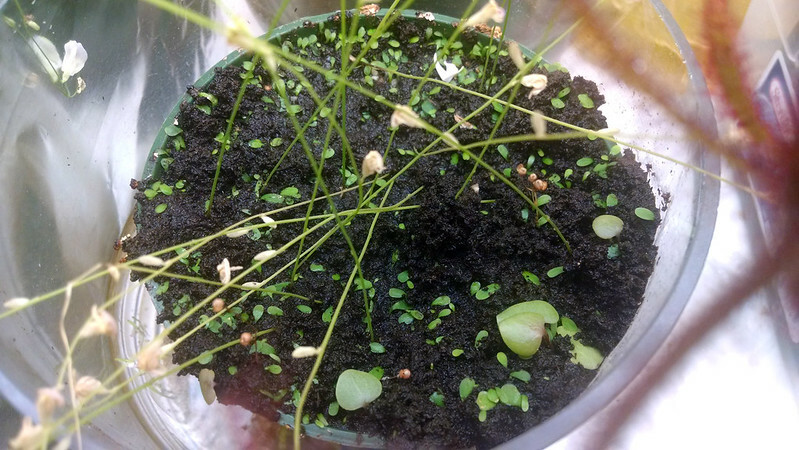 Finally, my Utricularia graminifolia is growing in again after I traded a couple chunks away. Sort of growing in. I should experiment with different methods with this plant. I had this growing in a windowsill earlier, and I feel like it was going a bit faster then. It's under lights right now. I'll leave it for a couple more months and see if it really wants that filtered sunlight instead. I've read that natural light is important to get it to bloom. Who knows. Streamers made with exchanging fall leaves and flowers add a unique touch to any Thanksgiving enhancement if hung or set imaginatively on table-tops or roofs. For the woven artwork and upholstery, it's constantly great to adhere to the autumn shades. Also, silk textures are better choices when it's a Thanksgiving beautification in plan. So pick consumed orange blinds with a silk complete, have a golden hued table cloth or spread out a yellow-ochre cover to emit the season’s brightness. When making purchases on the web, many companies, including those which may offer modest Valentine's Day flowers, have coupon codes accessible to get discounts on products and services. These coupon codes can give a substantial boost to your Valentine's Day https://www.thevalentinesflowersdelivery.com/ spending plan without sacrificing quality.